Self defense is really important especially when in a survival situation. Using a non lethal self defense weapon is an effective way to protect your family and yourself against an aggressor. One of the most popular and effective self defense weapon today is the stun gun. It is a type of non lethal self defense weapon that uses powerful voltage of electricity to stop and incapacitate an assailant. By having a stun gun you will be able to neutralize any type of target without the risk of killing it. Most stun guns carry between 20,000 and 150,000 volts with an effective range of 15 to 20 ft. The stun gun works by stopping the electric pulses from a targets brain through electric shock produced from the gun stopping all physical functions for a short period of time. Some stun guns have 200, 000 – 1,000,000 voltage power making it an effective weapon to incapacitate any type of aggressor. It is very important to learn how to use a stun gun effectively before using it. By watching video tutorials online or reading the manual you will be able to learn how to use and maximize your stun gun’s affectivity. Remember, there are two types – close range and projectile. The projectile ones will keep you safest, but also put a bigger dent in your wallet. 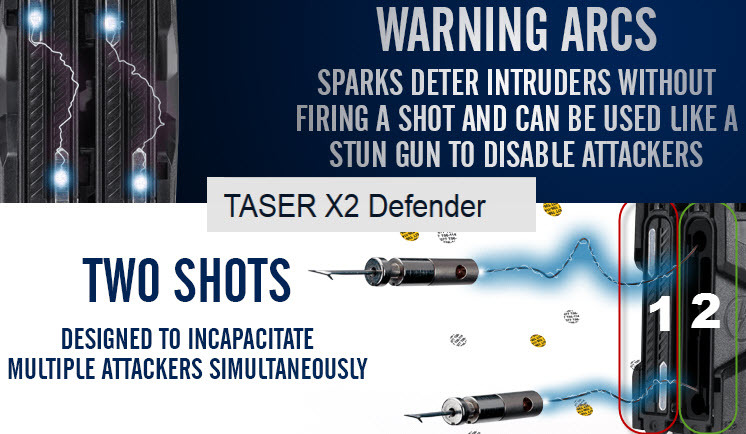 Top of The Line Taser: X2 Defender – If you’ve got over $1000 dollars to spend, nothing will scare the crap out of and shock the crap out of assailants like the X2 defender. 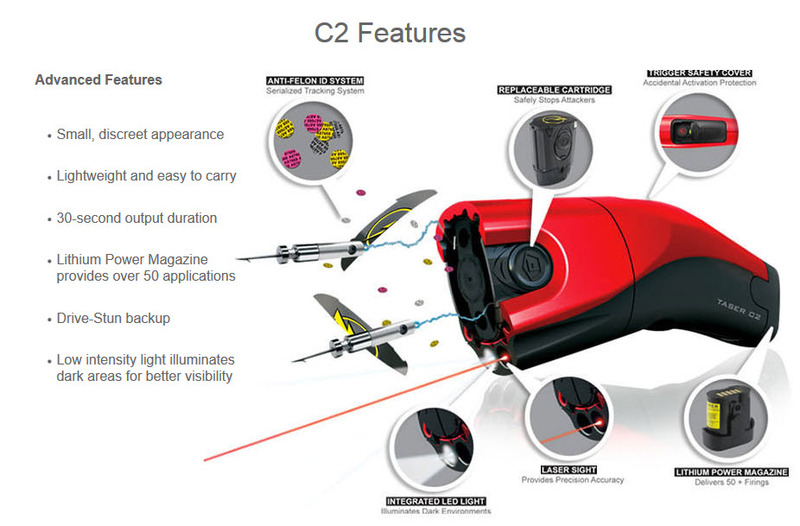 Check out this image for its best features. 1. You have to make sure that you hit the target with the stun gun before pressing its button to allow the electric shock to directly hit him. Hold the stun gun against the attacker for 3 to 5 seconds before pulling it away depending on the stun gun’s voltage power. Do not be afraid to use the stun gun in close range because the electric voltage from the gun is only powerful enough to enter the target’s body. It will not electrocute you even if you are in contact with the target. 2. Always remember to use the safety button of your stun gun to avoid unnecessary accidents. There are times when stun gun owners accidentally shock themselves when reaching for their gun from their purse or pockets. The lock is also a good safety feature to protect children from your group or family from being electrocuted. Keep from touching the probes in your stun gun. Always handle the gun on the switch and security plate area to avoid shocking yourself. Remember to only press the button when engaging a target. It sends out powerful electric current until you release the switch so don’t press it if you’re just playing around. 3. Learning when to use a stun gun is very important to successfully defend yourself. If you are walking into a dangerous territory like a dark alley and you feel the danger of being attacked then you need to have the stun gun ready in your hand and not inside your bag or pockets. It is important to learn how to effectively use your stun gun in different environments and situations so you will be able to successfully defend your family and yourself. Practice using your stun gun to familiarize the techniques and process in using it. 4. Always be prepared to use your stun gun. Do not put yourself in a dangerous situation where you are still scrambling for your gun when someone is attacking you. Always keep in mind to have your stun gun ready when you feel uncomfortable or when in a dangerous situation. Practice and memorize how to hit and deliver the amount of voltage required to stop an attacker. Remember to hit the target first before pressing the button to deliver the electric shock. Never be afraid to use too much voltage because it will not kill the attacker. It is better to be safe than sorry. Having a self defense weapon is very important. It makes you feel safer especially when in a survival situation. You will be able to walk around or explore without the fear of not being able to protect yourself or your family. Non lethal self defense weapons are also legal to carry and it will help defend you from attackers that may cause potentially serious injuries. Remember that you are responsible for you and your family’s safety, so do not hesitate to carry and use a stun gun for protection. Next article Does Pepper Spray Really Work For Self Defense? Jack can you tell me if there is an electrical device similar to a sten gun that could penetrate an internal wall and cause very sharp pain in the body?